In the future, GO FAIR may organise the certification of services, tools, organisations, and people (including data stewards). This would help research funders and other stakeholders to promote open science, for instance by enabling researchers to incorporate a certified service in their data stewardship plans. 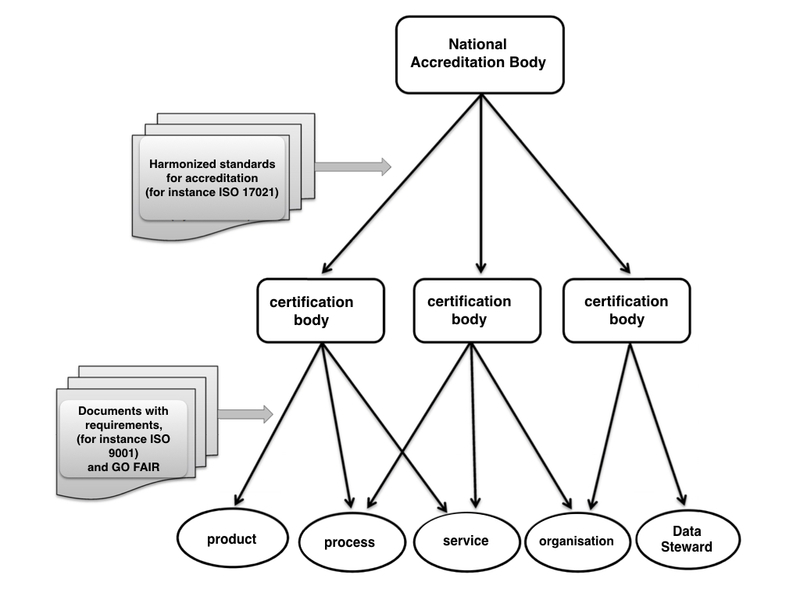 If an existing accredited organisation already certifies certain tools or services (such as repositories), we will first discuss with that organisation whether it can add (GO) FAIR-related certification schemes to its service. If such an organisation does not exist (in a given country), we will follow the simple rules as established in the Netherlands, unless these are incompatible with the rules in a given country. The stakeholders that will compile the ‘certification scheme’ (i.e., the criteria to be adhered to) will always involve different stakeholder constituencies (for instance government, funders, researchers, and other societal groups where appropriate). The simple scheme as proposed in the Netherlands is depicted below. European Member states follow the same scheme. In short, the stakeholder community will define the ‘certification scheme’ for a certain service or person. The GO FAIR International Support & Coordination Office (GFISCO) will support this process and act as the ‘certification scheme owner’ at least during the first phase of GO FAIR. In each participating country, one or more certification bodies can be engaged or started, to certify for instance data stewards (including exams), repositories, algorithms, core resources, registries, ontologies, etc. These certification bodies should apply for accreditation from their national accreditation body to ensure their independence and competence, while performing certification of specific elements of the Internet of FAIR Data & Services. They will have a contract with the Certification Scheme-owner (initially the GFISCO) and are allowed to charge the requesters (companies, service providers, people). All this can be regulated by country and by funder. It is conceivable that the GFISCO will hand over the ownership of the certification schemes to another party as soon as the scheme is mature enough.